Baker, G.R., A. MacIntosh-Murray, C. Porcellato, L. Dionne, K. Stelmacovich and K. Born. 2008. 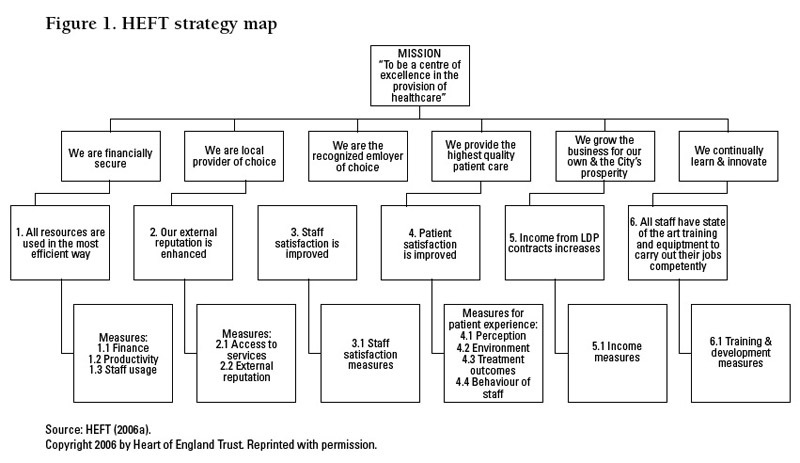 "Birmingham East and North Primary Care Trust and Heart of England Foundation Trust." High Performing Healthcare Systems: Delivering Quality by Design. 27-64. Toronto: Longwoods Publishing. In 2005 and 2006 the Birmingham East and North Primary Care Trust (BEN PCT) was short-listed for the Health Service Journal award for Primary Care Trust of the Year (Health Service Journal Awards 2005, 2006). BEN PCT's orthopaedic triage service won the Health Service Journal's access award in 2005 for its work in managing referrals to orthopaedics in primary care settings, decreasing patient waits and increasing patient satisfaction and access (Health Service Journal Awards 2005). BEN PCT changed from the worst-performing area in the country for over-prescription of antibiotics to winning an award from the Royal Pharmaceutical Society for its achievement in reducing prescribing levels (Birmingham East and North Primary Care Trust 2006b). Good Hope Hospital's redesign of its vascular surgery clinic and community leg ulcer service won the National Health Service (NHS) Innovation Award for Service Delivery in 2004 and the Healthcare IT Effectiveness Award's Best Use of IT in the Health Service and Best Innovative Use of Technology awards in 2005 (Healthcare IT Effectiveness Awards 2005). The Heart of England Foundation Trust (HEFT) won the Acute Care Trust of the Year award in 2006 (Health Service Journal Awards 2006). BEN PCT is one of 152 primary care trusts (PCTs) in the NHS (see Appendix A for background information on the NHS). Responsible for improving the health of their registered populations within their geographic boundaries, PCTs commission services from providers to meet health needs following NHS service principles (i.e., universal cradle-to-grave coverage that is free at point of use). The potential providers with which they contract range from foundation trusts (hospitals) and provider trusts (district general hospitals and community services) to the voluntary and independent sectors. Part of the West Midlands Strategic Health Authority, BEN PCT was formed in 2006 by combining the former Eastern Birmingham and Northern Birmingham PCTs. Birmingham is the second largest city in England and BEN PCT serves a diverse population of 433,000 in the eastern half of the city. The effects of socio-economic disparities in this area pose considerable healthcare challenges, with striking contrasts between the better-off Sutton wards in the north ("much more wealthy, middle class, and white" with "better infrastructure") and wards in the east that are among the "most deprived" in England (remarks from a slide presentation by the BEN PCT chief executive officer [CEO] on November 2, 2006). In the eastern wards the Southeast Asian population tends to have higher mortality and morbidity rates, such as lower life expectancy and higher cardiovascular mortality rates among males and above-average infant mortality (BEN PCT 2006). Cultural factors influence care-seeking as well as what type of care is considered culturally appropriate, needed and available in the community. The PCT contracts for the full continuum of health services for the population within its boundaries as well as providing some services directly. The PCT also pays for independent general practitioners (GPs), dentists, pharmacists and optometrists. For BEN PCT this includes 84 GP practices (237 GPs), 46 dental practices, 95 pharmacies and 83 optometrists. According to a slide presentation by the BEN PCT CEO on November 2, 2006, the PCT has a core annual budget of £560 million ($1.28 billion CAD) and approximately 1,700 employees (BEN PCT 2007a). In addition it hosts £600 million of specialized services commissioning, covering low-volume, high-cost services for the 5 million people of the West Midlands. BEN PCT is governed by a board composed of a chairman, seven lay members, members of the PCT executive and representatives of the PCT's professional executive committee (PEC). The PEC is the formal clinical leadership group, taking executive responsibility for clinical strategy and policy (BEN PCT 2007b). HEFT, which includes Heartlands Hospital, Solihull Hospital and Good Hope Hospital NHS Trust, is one of the provider organizations from which BEN PCT commissions services. As a high-performance hospital trust, HEFT was granted foundation trust status in 2005, a designation that gives more autonomy and independence from government control (although HEFT is still subject to regulatory standards and review) (Department of Health 2007a). HEFT is one of the largest trusts in England, with over 6,000 staff members treating 84,000 in-patients, over 350,000 out-patients and approximately 140,000 emergency cases each year (HEFT 2007). HEFT hospitals provide national and regional clinical services as well as specialized acute care, emergency and elective care. In October-November 2006 a team of researchers from the University of Toronto's Department of Health Policy, Management and Evaluation visited BEN PCT and HEFT. This site visit was part of an initiative called Quality by Design, which aims to identify and define elements of healthcare systems capable of improvement with a view to helping to inform strategic investments in improvement capability in Ontario. Quality by Design is funded primarily by the Ontario Ministry of Health and Long-Term Care in partnership with the University of Toronto's Department of Health Policy, Management and Evaluation. BEN PCT (including HEFT) was one of five healthcare systems selected from a short list of high-performing systems nominated by a panel of international leaders and experts. In Birmingham the team met with and interviewed administrative and clinical leaders, improvement team leaders and members, as well as support staff working to make improvements. This case study highlights the findings of that site visit. The trusts are among the national pilot sites for the Making the Shift project, which is an initiative of the NHS Institute for Innovation and Improvement (the Institute). Making the Shift aims to move needed services from hospitals to primary care in order to better integrate access to services in the community (see Appendix A, sections 7.1 and 7.3, for more information about the Institute). Three project teams are working on lower-back pain management, heart failure and integrated continence service. They have designed clinics and care paths to coordinate care in the community by using providers from several disciplines and patient education programs as well as by decreasing wait times and unnecessary referrals to specialists. Hospice at Home: To improve palliative care in the home by redesigning positions for "health care assistants with specialist interest in palliative care"
The Partners in Health Centre is located near the HEFT Heartlands Hospital, in one of the most economically disadvantaged wards of the PCT. Opened in 2005 the building itself is "a neutral meeting space," a physical symbol of the partnership between the PCT and the foundation trust and a place where teams can collaborate on improvement and care redesign projects as part of the Working Together for Health initiative. The centre provides a focus and home for holistic, multi-provider care programs aimed at self-care and education of patients so that they can take responsibility for their own health. The programs mix clinicians from primary and secondary care (spanning both organizations) and provide support services not available in hospitals or primary care for patients with chronic conditions such as diabetes, COPD, heart failure and degenerative musculoskeletal disease. The centre also provides a base for the orthopaedic triage service. This award-winning service (Health Service Journal Awards 2005) is based on screening and intervention by extended scope physiotherapists who triage patients for all conditions for which a GP feels an orthopaedic consultation is required (see Appendix A, section 2.2, for more about role redesign). The service began with screening hip and knee conditions and expanded its scope in 2005 to full musculoskeletal triage. The team mapped processes across primary and secondary care, building a database for more rigorous data collection and reports on referral patterns, wait times and outcomes. Team members designed and implemented care pathways that expand primary care and incorporate alternative care choices for patients (compared to traditional surgical or medical treatment), including acupuncture, mobility groups, exercise programs, pain management clinics and expert-patient programs. The service has reduced wait times and routine referrals to orthopaedics and has resulted in improved access and patient satisfaction levels. In line with national policy directions it has also increased the choice of providers for patients (see Appendix A, section 3.2, for more about the patient choice policy). Leg ulcers are a chronic condition that benefit from careful and timely management by specialist out-patient services. In Good Hope Hospital, Simon Dodds, a vascular surgeon skilled in methods of value stream analysis and process design, led the redesign of the booking system and flow in the vascular clinic, eliminating 12 weeks of delays and adding 40% capacity (Dodds 2005, 2006). In addition, Dodds and his team designed a secure shared e-record, an electronic linkage with the PCT nurses providing wound care in the community. The system enables rapid referral, digital images and access to remote expert advice and follow-up. In a presentation on November 2, 2006, Dodds reported that changes have resulted in improved healing rates of 64% at 12 weeks (compared to studies that have shown healing rates of 22% at 12 weeks for community care and 40% with the addition of specialist out-patient care) and significantly reduced costs. Launched in April 2006, Birmingham OwnHealth® involves telephone-based care management in the community for over 900 patients with chronic conditions (diabetes, heart failure and coronary heart disease [CHD]). The service - commissioned by BEN PCT from NHS Direct - was developed as a partnership between the PCT, Pfizer Health Solutions and NHS Direct. It is based on an earlier Pfizer initiative called Florida: A Healthy State, which was undertaken in conjunction with the State of Florida's Agency for Health Care Administration. NHS Direct is the national 24-hour health and illness information service provided by telephone and on-line (NHS Direct 2007). Birmingham OwnHealth® is based in one of NHS Direct's call centres and is staffed by 12 care managers who have experience in telephone nursing services and who have been trained by NHS Direct. The care managers can support up to 200 patients each, educating them about their conditions and beneficial lifestyle changes and helping them set and monitor their health status and treatment goals. The care managers' objective is to promote self-management of patients' conditions, thereby reducing avoidable morbidity and mortality as well as reliance on acute services. Birmingham OwnHealth® is tracking outcomes, including clinical measures (e.g., blood pressure, HbA1c, body mass index, depression scores), unscheduled admissions and patient satisfaction. To measure progress toward self-care and health promotion, case managers assess the stage of change that participants have reached (i.e., pre-contemplation, contemplation, preparation, action, maintenance). After three months over 52% of patients had improved their stage of change for diet and 22% had increased their exercise levels. In just under six months Birmingham OwnHealth® has demonstrated a decrease in unscheduled care utilization (acute care admissions and accident and emergency [A&E] department and GP visits), although it should be noted that this is based on a very early-stage evaluation. Ninety percent of participants reported satisfaction with the quality of the service (Birmingham OwnHealth 2006). To better manage and prevent hospital admission for chronic diseases, clinical leaders at BEN PCT adapted Kaiser Permanente's three-level model for population management (i.e., level 1: the 70%-80% of the chronic care population that requires usual care with support; level 2: high-risk patients requiring assisted care or care management; level 3: highly complex patients requiring intensive care or case management). Launched in 2004 this model of care provides a systematic approach for prioritizing and stratifying patients according to risk and for applying a step-up and step-down approach to match skills and resources to patient need. Specifically, the model uses entry and exit criteria for three risk segments and progressive involvement and intensity of care providers with patients able to move up and down to accommodate changing clinical needs (i.e., high: district nursing teams; higher: assertive case managers; highest: advanced nurse practitioners). GPs use a validated and computerized system to routinely identify and refer patients who are appropriate for assertive case management, and specialist nurses follow up with a validated and computerized risk prediction system. The model emphasizes cascading clinical leadership and collaboration with supervision and shared care starting from GPs. It also employs a hospital alert system to track the case-managed patients' use of hospital services. In addition, in order to build capability for this model and encourage career progression BEN PCT has integrated specialist training for case management for chronic conditions into its competency and training framework. Among a pilot population this model has led to a 50% reduction in unplanned hospital admissions, a 55% reduction in A&E visits, a reduction in polypharmacy and an increase in patient satisfaction and compliance. Over the last year the PCT's emergency admissions to hospital were slightly reduced against a national 8% increase, and attendance at A&E stayed the same against national growth. "We have to keep agile and nimble, with the right principles in mind." The two CEOs, who have credibility, authority and very different - yet complementary - leadership styles, have played a central role in shaping the trusts' improvement journeys. The PCT CEO, Sophia Christie, recounted that as they began Working Together for Health she wanted wholesale change "yesterday," whereas the HEFT CEO, Mark Goldman, cautioned, "Steady, we are dealing with physicians." The Department of Health placed "incredible pressures on NHS executives; going too quickly would have destroyed the projects, yet going too slowly would have destroyed us." The BEN PCT and HEFT CEOs worked hard with their boards to ensure they would see how their plans could be "pro-patient care," despite the financial disincentives and national policies that created obstacles. For example, the trusts are collaborating to avoid in-patient admissions by providing more comprehensive community-based services, yet the acute care trust stands to lose revenue by doing so (see Appendix A, section 3.1, for more about the payment system). In the PCT leaders decided that "even if changes we made put us financially at risk, we would do so to make sure we were providing the right services" (PCT CEO). The BEN PCT and HEFT "partnership plans were a bit contrary to the Department of Health (DOH) rules. ... When we developed the approach it was against national policy. National policy moved towards us, not the other way around!" (HEFT CEO). There is an increasing policy emphasis in the United Kingdom (UK) on, as the BEN PCT CEO put it in a slide presentation on November 2, 2006, "providing services where they give best value." However, financial mechanisms are not aligned with this goal. The HEFT CEO stressed the difficulties encountered in his trust's "attempts to hold open the doors of the hospital to let patients go to primary care" in the face of adverse financial consequences for the hospital. When HEFT became a foundation trust in May 2005 their collaborative effort "almost came off the wheels" due to the scrutiny of Monitor (the regulatory agency for foundation trusts) and the pressure of Monitor's expectations for the trust's financial growth (see Appendix A, section 3.3, for more about Monitor). Complicating their management responsibilities even further, significant restructuring occurred around this time in both trusts. The amalgamation of Eastern Birmingham PCT and Northern PCT raised cultural issues, the lack of a shared acute care strategy and resistance from Northern PCT to dealing with patients from the eastern wards. HEFT took over responsibility for (and has since merged with) Good Hope Hospital Trust, which had considerable financial problems. Both CEOs observed that they sacrificed progress in the trusts for which they were originally responsible as they worked to straighten out issues arising from the later additions. However, their work has proven to be part of a politically astute strategic vision for integrating care and improving patient access, outcomes and choice. "Adapt improvement tools to use them in a situation that is already prepared." The Eastern Birmingham PCT had a history of investing significant time and energy in organizational development based on a "large system approach" using "whole system events" (Beedon and Christie 2006). With the assistance of an organizational development consultant the PCT CEO works in a very hands-on fashion to ensure as many staff members as possible are engaged in a meaningful way in shaping the organization. This approach has been continued successfully during the strategic integration of BEN PCT, with the involvement of large numbers of staff and stakeholders in the design process for the new organization's strategic goals and values. Participants were encouraged to come up with "great, big, hairy, audacious goals" (Collins and Poras 1994) and the CEO promised, "Whatever you come up with, we will live with and do." Working in partnership to tackle inequalities and improve the health and well-being of local people. To be so responsive to the population we serve that no one waits for the healthcare they need. That the health and well-being of the population will have improved so much that people will enjoy 10 more years of quality life. Our communities will be the most involved, informed and empowered in the country. That people regard us as the first choice organization to work with and for. HEFT has likewise launched Moving Forward Together, a "massive, fully integrated organizational development program" (HEFT CEO). This program will develop the vision, values and behaviours of the newly merged organization as well as the skills and competencies required of staff through "skills based programs, local facilitated problem solving initiatives, and leadership development" (HEFT 2006a, 2006b). The members of both executive teams stressed the importance of paying attention to organizational culture and preparing the organizations for change so that improvement tools and interventions can be used effectively. In the PCT CEO's words, "Adapt improvement tools to use them in a situation that is already prepared." HEFT is developing its own "Lean academy" on site and is training staff in Lean improvement methods and process mapping; however, "cascading it through will be a slow process over several years as we train people" (senior clinical leader). BEN PCT is a pilot site for the Institute's shifting care initiative; therefore, staff members involved in those projects use improvement methods adapted by the Institute. Members of both organizations cautioned, "It is more than just a formula that you can apply from the Institute; you need the formula, but you need to adapt it and work with it" (senior leader). They observed that the former Modernisation Agency "was not successful because it focused its efforts on the improvement processes within projects led by single champions, but outside of the [organizational] culture, and it could not move the projects into the rest of the industry" (see Appendix A, section 7.1, for more about the Modernisation Agency). "The reason that we have been able to do what we have is because we have the processes - the project-level processes and improvement skills - aligned with the system, strategy and leadership" (PCT CEO). The trusts had six or seven years of experience with earlier change efforts, which helped them to understand how to manage the tension between project-specific goals and the long-term vision. This enabled them to make the joint projects work more quickly in a short time frame. Both CEOs commented on the need for early gains through quick interventions: "We emphasize getting on with it instead of talking about it for ages. ... This approach is transactional as compared to transformational. If you start with small projects and keep expanding, eventually there will be no turning back. The best way to create sustained change is to do it on this evolutionary, project-by-project, phase-by-phase approach" (HEFT CEO). As an example of the phase-by-phase approach, the trusts started their Working Together for Health collaboration with small-scale projects in diabetes care management. A review showed that their Asian population had severe diabetes complications, yet no coordinated management program was in place for them in primary care. The PCT's director of health improvement worked on a management plan to create a community diabetes service, a link between primary care GPs and specialists. The trusts conducted a chart review to gather needed data (there had been no data collection in the past, so they were missing information on 1,000 diabetic patients). The diabetes care management program is flexible, with an aim of building capacity within primary care to handle the care provision for the target community. The service includes a consultant nurse, two specialist nurses, educators who speak more than one language and a physician consultant (a joint appointment between BEN PCT and HEFT). A senior clinical leader noted that one of the challenges they face is "how to grow the right, skilled population of care providers; that is, taking those who are used to giving care to individual patients and turning them into consultants who advise." The interventions require extensive education, yet physicians (who often work in large, busy practices of one or two GPs) are far too busy to attend outside sessions. Trust staff therefore take these improvement programs to the practices. Funding improvement work "is not a simple thing" (PCT CEO). The PCT has opportunities to bid for external funding, but not a lot is available; therefore, "We've dragged in money from here and there in different ways. ... We have been in a good position to bid opportunistically on some opportunities because of good results and experience." Their Working Together for Health initiative is staffed by a program director, who supports its projects, attends meetings, helps with data collection when necessary and has made use of the strategic partnership with the organization development (OD) consultancy to continue developing expertise in improvement tools and cultural change. BEN PCT and HEFT have actively sought out other organizations, both within and outside healthcare, from which they could learn. For example, BEN PCT representatives visited the Body Shop chain to learn about franchising models and then had sessions with the trust's GPs aimed at helping them to look at their practices as franchises. The knowledge - "the idea that you didn't get money for nothing, that there are standards and expectations" - made a big difference with GPs. The trust began to tie incentives to clinical practice change, for example, to encourage inclusion of smoking cessation and diet counselling as well as preventive care. This funding strategy has been broadened by the new NHS Quality and Outcomes Framework (QOF), which includes quality standards and indicators monitoring in the general and medical services' contracts for primary care (BEN PCT 2006: 35) (see Appendix A, section 3.3, for more about the QOF). Perhaps the most significant external influence on Working Together for Health has been Kaiser Permanente. This large, integrated health organization and health plan from the United States (US) has played a major role as a resource that provides ongoing support and contact. "We cannot overemphasize the importance of Kaiser, the influence of seeing their plans and work and the encouragement that we could get there too, that it was possible. It was a mentorship relationship. We could not have done it without them" (senior clinical leader). The trusts' relationship with Kaiser Permanente began in 2003, when the Department of Health offered several NHS trusts the opportunity to participate in an initiative facilitated by Professor Chris Ham of the University of Birmingham, a study tour site visit to Kaiser Permanente with the intent of working together to adapt lessons learned (Ham 2006). The PCT CEO decided to invite a multidisciplinary clinical team chosen from across the trusts to attend the first site visit. Upon the team's return, the trusts began implementing small-scale projects with GPs who were interested in doing things differently with their particular groups of patients (an "artisan approach"), with project support from the newly appointed project manager. The trusts' collaborative program, Working Together for Health, was born. Some medical staff, as well as some community members who did not want "American healthcare," reacted negatively to the thought of adopting Kaiser Permanente's approaches, such as the view that less costly, more effective care can be delivered closer to home. Adoption of Kaiser Permanente's approaches was controversial enough that at the beginning team members were advised not to use "the K word." As a result, when they started work on their first four clinical areas (diabetes, COPD, orthopaedics and heart failure) using the Kaiser approach, members "rebadged" it to make it their own. Later, in 2004, the two CEOs and the chair of the PEC spent four days visiting Kaiser Permanente. Both CEOs highly valued this exposure and planning time, which resulted in the agreement that they needed to make a visible commitment personally to the change initiative that their organizations had undertaken together. "We decided to stay with it until it would be unstoppable." In January 2005 they involved 26 clinicians in a week-long workshop with their Kaiser partners. Since then there have been multiple visits to Kaiser; ongoing linkages include annual meetings with Kaiser staff as well as telephone contact. Senior leaders in the PCT and HEFT described the relationship with Kaiser as "incredibly invigorating," adding, "there is a great deal of largesse about how they have related to us." Physicians hold major leadership roles in the trusts. For example, HEFT has implemented "a very medical model." The HEFT CEO, who is a surgeon by training, remarked, "We learned this from Kaiser: if you don't have the physicians on board with you, you can't succeed." One of the senior managers observed, "We have a pretty powerful clinical management system. Most of the money is in the hands of doctors." In HEFT the three medical directors have operational line responsibility, and financial responsibility has been decentralized to these directorates. Physicians lead many of the clinical programs as well as improvement initiatives. The attitude of the nurses and allied health staff to this is quite interesting; according to several nurses in key positions, nurses are content to work alongside the physicians and behind the scenes, while letting the physicians take the lead. On the other hand, expanded roles for nurses and allied health professionals appear to be well accepted by medical staff. In addition, BEN PCT adapted the national PEC model to create clinical directors who have lead responsibility for core strategies. The pace and frequency of restructuring, intense scrutiny from regulatory agencies as well as the financial crisis in the NHS create a difficult working context for the trusts. Both BEN PCT and HEFT invest considerable amounts of time and resources in performance measurement and reporting. PCTs are subject to annual assessments by the Healthcare Commission against a set of core standards and targets (see Appendix A, section 4.2). BEN PCT has adapted these measures to fit their balanced scorecard (see Appendix B); each measure is discussed in detail in its performance report updates. Although HEFT's independent status grants it more operational freedom, this freedom comes with an immense financial pressure: "As a foundation trust, you can fall over completely and no one will save you. ... That has hardened our business approach; it's much more commercial" (senior leader). HEFT operates as a large healthcare enterprise, intent on expanding its market share to include more patients in the region, such as through its merger with Good Hope NHS Trust. It is also developing a range of commercial interests, such as the Heartlands Medipark, which will house a medical innovation development and research unit (MIDRU) as well as clinical and laboratory facilities. Because of their contractual relationship as service commissioner and service provider, BEN PCT and HEFT also work together on performance measurement and management. The trusts, with the addition of representatives from neighbouring Solihull PCT, hold Tripartite Performance Management meetings every three weeks to review scorecard targets and action plans, assess market changes and impacts of national policies and agree on ways of implementing primary care pathways. The directors that staff the committee report directly to the CEOs. These meetings are often very challenging; as the CEO of the BEN PCT commented, "It's the edgy bit where the arguments happen." Potentially conflicting interests arising from national policies create significant tensions; for example, an increase in hospital admissions might be positive as a revenue generator for the acute trust but is red-flagged as a cost increase for the PCT. BEN PCT's multiple roles also contribute to the tension. As a commissioner, BEN PCT is responsible for monitoring how costs and income are managed; as a partner, for maintaining constructive relationships with providers; and, as a provider of some services in the area, for avoiding perceptions of conflict that could arise from being both fund holder and service provider. However, because the trusts have invested so much in developing their partnerships they are able to have productive discussions about the strategic issues that cut across the region, while avoiding breaching NHS rules about collusion. 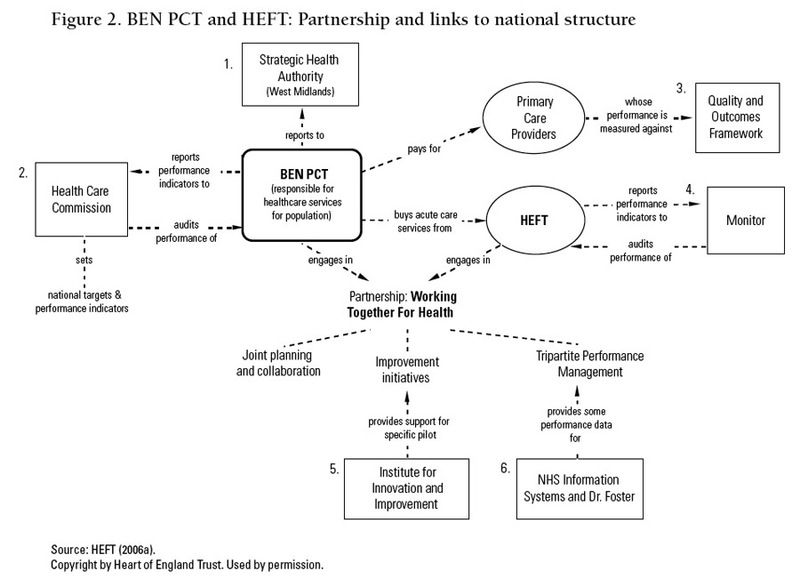 BEN PCT and HEFT have worked hard to develop partnerships necessary for improving care in the complex UK healthcare environment (see Figure 2). Several key factors have shaped the growth of BEN PCT and HEFT as systems capable of improvement: for example, strong, capable leaders with clear vision and determination to stay the course; ongoing investment in organizational development and improvement skills that prepared the way for change; and a serendipitous learning opportunity that turned into a continuing mentoring relationship with Kaiser Permanente. The trusts have also shifted away from traditional care delivery within specialist silos in dominantly acute care settings to redesign and integrate care based on the needs of their entire population. The PCT is also working to extend its network of partnerships to include social services, a move that adds to its complex responsibilities but also offers the opportunity to integrate further services to meet population needs (see Appendix A, section 2.4, for more about health and social care integration). To accomplish these changes the trust leaders encourage local innovation and collaboration with external resources, including industrial partners such as Pfizer Health Solutions. They have also built a robust business case for their approach to improvement, redesigning services in an effort both to meet population needs and to reduce costs in the face of the immense financial pressure felt throughout the NHS. The trusts continue to face significant challenges in the ever-changing UK healthcare environment. The focus on financial discipline in the NHS, for example, has continued to escalate, resulting in sizeable budget challenges for the trusts and the PCT facing the need to reduce costs by £26 million in one year (a challenge it has successfully met). The productive partnership between BEN PCT and HEFT has been shaped by the strong working relationship between their current leaders, individuals who have undertaken to stay in their roles until the improvement momentum is "unstoppable." Although one CEO commented, "We are almost there," it remains to be seen whether the cultural transformations will be sustained as leadership positions change in the future. Introduced in 1948 in the aftermath of the Second World War, the NHS is the UK's healthcare system and Europe's largest employer (the NHS employs 1.3 million people across England, Wales, Scotland and Northern Ireland). Financed largely from general taxation, the NHS was originally founded on the principles that healthcare is free at the point of delivery, available to all who need it and based on clinical need and not ability to pay. The Department of Health has political responsibility for the NHS, managing it at the top through policies and programs and under the leadership of the secretary of state for health. The NHS was initially structured with three arms: hospital services by regional hospital boards, primary care with GPs (dentists, opticians and pharmacists) as independent contractors and community care services managed by local authorities (for a history of the NHS, visit https://www.nhs.uk/england/aboutTheNHS/history/default.cmsx). 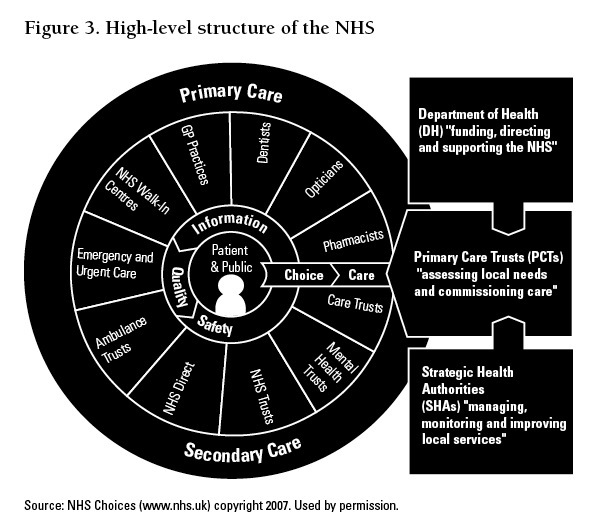 Today, the structure of care delivery in the NHS emphasizes local decision-making, as shown in Figure 3. PCTs - local groups of planners and providers of primary care - hold over 80% of the NHS budget. These trusts are responsible for assessing local needs, planning and commissioning both primary and secondary care services to meet these needs and providing some primary care. Hospitals, ambulances, specialist providers and providers of mental health and other health and social care are also organized into trusts that contract with PCTs. The over 150 PCTs report directly to 10 strategic health authorities (SHAs). These authorities are the key link between the NHS and the Department of Health, and are responsible for managing and monitoring the performance of local services and ensuring that these local services are aligned with national priorities. Since its inception the NHS has evolved into a £96 billion-budget organization and has undergone several periods of reform. Following a steady pace of change, the past 15 years have brought an unprecedented scale of transformation to the structure, financing and way in which care is delivered in the NHS. For the most part "a crisis of confidence in the NHS" - and specifically in quality of care - is seen as the driver of such large-scale reform (SteelFisher 2005). The crisis in quality was illustrated by long wait times, higher than average mortality rates for key conditions and notable tragedies, such the death of 29 children at the Bristol Royal Infirmary. Observers have attributed this crisis to several factors, in particular, to an underinvestment in capacity (e.g., healthcare providers, equipment), a lack of standards and incentives for higher quality care, outdated boundaries between sectors and providers, overcentralization and disempowered patients (Enthoven 2000). Over the past few decades the NHS's most significant transformation efforts were launched by white papers and other key consultation documents that outlined a series of interdependent reforms and priorities. Appendix A(a) describes a selection of these documents. Overall the NHS's policy context has been shaped by several key reforms. The extent to which these reforms have been levers for improving quality varies. A discussion of these reforms follows. Growth in funding and capacity has played a key role in the supply-side reforms of the NHS in the past two decades. To bring investment to a level equivalent with other European systems, NHS funding increased by "one half in cash terms and by one third in real terms" over five years. This increase funded investments in new NHS facilities (e.g., 100 new hospital schemes; 2,100 additional general and acute beds; 500 new primary care centres) and staff (e.g., 2,000 more GPs; 20,000 extra nurses; 1,000 more medical school places) (Department of Health 2000). Such capacity growth was viewed as necessary but insufficient to relieve pressures on hospital beds, staff and wards, and to achieve and sustain the national targets for reducing wait times. Therefore, parallel strategies were put in place to develop a permanent increase in the volume of services delivered to patients. Typically commissioned from independent sector companies, these strategies included independent treatment centres that provide scheduled day and short-stay surgery and diagnostic procedures, overseas teams that carry out high-volume and non-complex surgery in high-pressure specialties such as orthopaedics and ophthalmology and an overseas treatment option for patients who choose to undergo orthopaedic, ophthalmological and cardiac procedures in France, Germany and Belgium (Department of Health nd a). By harnessing these strategies NHS leaders aimed to develop an independent sector that could carry out up to 15% of procedures each year for NHS patients, paid for by the NHS. To support the growth in "independent sector" options and a plurality of providers, NHS leaders also increased the number of physicians entitled to discretionary private sector payments. These independent sector options are subject to audit to ensure they provide extra capacity for care overall (rather than limiting capacity in the NHS), offer value for money and meet high clinical standards. Although there are ongoing debates about the disintegration of the NHS as a result of the growing independent sector (McGauran 2004) the NHS's success in streamlining access to care and reducing wait times is widely attributed to this strategy. In addition to growth in actual capacity, several national reforms have focused on service and role redesign in the NHS as a means to improve productivity and, ultimately, to improve quality. One of the most profound changes is the increase in flexibility and removal of boundaries across traditional roles in primary care, especially between physicians and nurses and allied healthcare providers. Several professions have extended their scopes of practice and accompanying specialist skills training. For example, since 2005 physiotherapists, radiographers, podiatrists, optometrists and pharmacists have had prescribing authority, and some of these professionals are able to perform minor procedures previously limited to specialist physicians (Department of Health nd b). Several NHS reforms have focused on developing a primary care-led system and increasingly devolving influence and control of budgets and planning to front-line healthcare providers. These reforms have included GP fundholding in the early 1990s, which was eventually abolished; commissioning by PCTs, which has remained the dominant model for the past decade; and the recently introduced policy of practice-based commissioning (PBC). PBC is currently positioned as "the engine for change" in the NHS and gives GP practices their own "notional" budgets to purchase care for their patients, including emergency care, out-patient and in-patient treatment and drugs (King's Fund 2006). This policy aims to raise GPs' awareness of the financial implications of their prescriptions and referrals and motivate them actively to redesign innovative, cost-effective and responsive services for patients. There are examples of trusts that, by embracing PBC, have emerged as "care entrepreneurs" in the redesign of care. Such redesign includes partnering with social care and other providers to help manage chronic diseases and avoid hospital admissions by leveraging healthcare team members who have specialist training for procedures that would normally occur in hospital and by purchasing diagnostic technology for use in the community. Under this scheme, GP practices are accountable to PCTs, which directly administer funds and remain legally responsible for them as well as provide GP practices with data on their patients' utilization of services (e.g., diagnostic tests, prescribing, hospital and emergency care) and the cost of this care. Incentives are available for practices that take up commissioning, including the ability to reinvest surplus funds. PBC has several perceived benefits, including improved coordination of primary, intermediate and community support services; clinical engagement in redesign of care and services; better collaboration between practices; more efficient and appropriate prescribing, referral and utilization of services; and care in more convenient settings for patients (Greener and Mannion 2006). However, as the Department of Health hopes to further spread and implement this policy across GP practices in the NHS there is considerable debate about whether PBC will overcome issues associated with the earlier fundholding model and whether it will be a lever to achieve change and improvement. Some observers raise concerns about the management and transactions costs. Others raise questions about whether there is sufficient evidence to support some of the key assumptions underpinning the model, including the belief that patients should choose providers (rather than commissioners) and that purchasers should commission based on population and geography (rather than individuals) (Higgins 2007). With the launch of the 10-year NHS Plan in 2000, leaders articulated a vision for better-integrated health and social care (Department of Health 2000). Social care (i.e., social services) in the UK is managed by local authorities. Since the original vision was articulated several models for joining health and social care have evolved. In 2002 the NHS piloted a new type of organization - care trusts. These bodies integrate health- and social care under a single organizational structure with multidisciplinary teams providing streamlined cross-disciplinary assessments. Conceived as a "new level" of PCT, these trusts aim to commission and deliver care to patients who require complex health- and social care in several parts of the continuum (e.g., acute, intermediate, home) and who would normally need to navigate two different systems. Patients who stand to benefit most from care trusts include those requiring mental health care, the elderly and the disabled. There are currently 10 care trusts in the NHS, fewer than initially forecasted. Observers remain divided about their value. Some see them as a structural innovation that improves access and delivers more flexible and holistic care. Others see them as an overemphasis on structural change when other partnership models would suffice (Glasby and Peck 2005). Several other reforms are under way to help facilitate more joint commissioning of health- and social care without extensive structural integration. These include a procurement model and best-practice guidance to underpin a joint commissioning framework; streamlined budgets and planning cycles based on a shared, outcome-based performance framework; aligned performance assessment and inspection regimes; and more joint health- and social care appointments. At local levels some PCTs are now partnering with local authorities to shape the way health- and social care are delivered for patients with chronic conditions. Most recently, in an attempt to enhance patient choice in new models of health- and social care the government announced a pilot of "individual budgets." This is a scheme that would enable people needing social care to design that support and give them the power to decide the nature of the services they need (Department of Health 2006a). Historically, trusts were paid lump sums based on block contracts and locally agreed prices. Introduced in 2004 as a pilot in several trusts and expanded across the NHS for non-elective and elective care in 2006, payment by results is an activity-based payment system, adjusted for case-mix that reimburses providers with a fixed national price or tariff for each case treated. Designed to be open and transparent, and underpinned by the principle that money follows patients, the system's goal is to increase productivity, reward efficiency and support patient choice (Department of Health nd c). Reports have shown that early implementation of the system exposed several weaknesses, including issues with data quality and accuracy of coding; inadequate involvement of clinicians in defining the tariffs, especially for complex cases and highly specialized care; and financial instability in some trusts. In addition, clinicians have expressed concern that by encouraging productivity within local organizations this system will fragment care and discourage collaboration across sectors for issues such as chronic disease prevention and management, and may lead to gaming or "upcoding" (King's Fund 2005; Dixon 2004). It is still too early to evaluate the impact of further expansion of this payment scheme. In conjunction with the tariff system, patient choice has been a key part of the NHS's recent policy reforms. As of January 2006 all eligible patients across England have the right to choose where and when they get hospital treatment. Through the Choose and Book initiative patients are offered the choice of at least four hospitals or clinics for further non-emergency treatment. One of these options is a private sector provider. People are able to book the time and date of their out-patient appointments at their GPs' offices through an online system that shows where and when appointments are available. In order to inform their choices, patients are provided with information on each of the options, such as details about transportation, parking and disabled access; information about the performance of the organization on key national targets; and patient satisfaction. Additional strategies are also under way to help support patient choice in the NHS. These include an online system called HealthSpace that allows patients to record their lifestyle and healthcare preferences on electronic medical records and an electronic prescribing service that enables patients to pick up repeat prescriptions from pharmacies of their choice (Department of Health nd d). By enhancing patient choice in the context of money following patients, the NHS hopes to reduce variations in quality, promote faster and better access across the NHS and ensure that NHS services continue to reflect patients' needs and priorities. The extent to which choice is actually a lever for improving quality remains uncertain. There is some debate that these reforms were too narrow in their application to elective services, given their irrelevance to other significant areas of healthcare, including care for chronic conditions or emergency treatment (Appleby 2004). The Quality and Outcomes Framework (QOF) (see https://www.nhsemployers.org/primary/primary-890.cfm) is a new system of financial incentives for GP practices designed to improve GP recruitment and retention. Historically, GP practices have been paid according to the number of patients on their registers, and they were required to be available outside normal working hours. Introduced in 2004 as part of the General Medical Services (GMS) contract, the framework allows GPs to opt out of providing services after hours, rewards practices for providing high-quality care and helps to promote further investment in improvements in the delivery of care. 1) clinical standards linked to the care of patients with chronic conditions; 2) organizational standards relating to records and information, communicating with patients, education and training, medication management and clinical and practice management; 3) additional services covering cervical screening, child health surveillance, maternity services and contraceptive services; and 4) patient experience based on patient surveys and length of consultations. Points and payments are awarded according to levels of achievement. QOF data are collected through patients' electronic records and fed into a national quality management database (see https://www.ic.nhs.uk/services/qof). Although participation in the QOF is voluntary, a large majority of general practices participate in the scheme. Clinicians and observers consider the framework to be a strong lever for improving quality, given its focus on rewarding general practice teamwork, allowing flexibility to choose specific targets and providing upfront funding to help raise quality standards. In addition to GP incentives the government developed a new type of incentive for NHS trusts in 2004. Trusts that demonstrate strong performance - in particular financial performance - are invited to apply for designation as foundation trusts. These trusts are independent public benefit corporations and are free from central government control and regional performance management. Independently authorized and regulated by an organization called Monitor, foundation trusts are free to innovate for the benefit of their local communities and patients, to independently decide and make capital investments, to retain any surpluses they generate and to borrow in order to support investments (on Monitor, see https://www.monitor-nhsft.gov.uk/about.php). There are presently over 70 foundation trusts in the NHS. Current policy envisions that all hospitals will evolve to become foundation trusts. Several of the reforms outlined in this section were explicitly designed to help meet national priorities and targets, especially for wait times. In the late 1990s the government set several targets for reducing wait times: six months on in-patient lists, 13 weeks on out-patient lists, 48 hours for an appointment with a GP and four hours before being treated, admitted or discharged from A&E departments. Virtually all these targets were reached by 2005, with a new target set for 2008: 18 weeks from GP referral to visit. While most observers agreed that wait times needed urgent attention and central investment, many now feel that some of the mechanisms for addressing these issues damaged morale and produced distortions in the system. For example, failure to meet targets led to executive replacement and, eventually, a significant turnover of leadership in the system (the link between targets and performance assessment is highlighted in the next section). In addition, the pressure to meet earlier wait time targets, which were virtually all focused on a patient's journey after diagnosis, produced longer "hidden waits," such as time to diagnosis. Clinicians and managers also worried that a disproportionate focus on wait times led to the treatment of less urgent and complex cases and a distortion of clinical priorities (King's Fund 2005b). In its 2004 Improvement Plan the government articulated its vision of shifting away from national targets and central regulation to local target-setting and performance management and to a focus on a new set of priorities. In addition to a strong emphasis on wait times there were many other NHS standards, targets and guidance rules, elements that overwhelmed many leaders and providers. In 2004 the government announced it would reduce the number of national healthcare standards and targets from 600 or more to 24 (Frith 2004). Among the new set of national priorities was a focus on prevention and support for individuals with long-term (i.e., chronic) conditions such as diabetes, heart disease, asthma and depression. The national system for assessing and reporting the performance of NHS organizations evolved in conjunction with other reforms, particularly the focus on national priorities, targets and incentives. Introduced in 2001 the "star rating" system used over 50 different standards to award hospital trusts up to three stars for performance. Top-performing trusts (three stars) were awarded cash bonuses, additional freedom from central control and the option of becoming a foundation trust. Lower-performing trusts (zero stars) that did not improve over time were threatened with the replacement of their executives and other consequences. This system of assessing and reporting performance was controversial; many observers felt it was too crude and unfairly punished hospitals and leaders. In 2004, when the Healthcare Commission for Audit and Inspection (formerly the Commission for Healthcare Improvement) - the independent inspection body for both the NHS and independent healthcare - undertook responsibility for performance assessment, it began the development of a new and more rigorous system. In March 2005 the Healthcare Commission launched the Annual Health Check. This performance assessment and reporting system measures NHS organizations against standards in seven categories: safety; clinical and cost effectiveness; governance; patient focus; accessible and responsive care; care environment and amenities; public health). In each of these areas the commission assesses and publicly reports whether organizations are meeting basic expected levels of performance and whether they are improving. In addition to developing the Annual Health Check, the commission regulates the registration of independent healthcare providers and conducts independent reviews of NHS complaints as well as value-for-money audits (Healthcare Commission 2005). As noted earlier, Monitor independently authorizes and regulates NHS foundation trusts. Private industry in the UK is also involved in measuring and reporting the performance of healthcare in the NHS. Dr. Foster, launched in 2001, is a commercial provider of information about the performance of NHS healthcare providers, including physicians, hospitals and other care centres. While the Healthcare Commission's performance assessments are publicly available, their primary audiences are NHS providers and the government. The target audience for Dr. Foster's service guides is the general public. Dr. Foster is widely considered to be a successful endeavour. In 1998 A First Class Service - Quality in the New NHS outlined new initiatives and tools for setting, delivering and monitoring standards for a high-quality, cost-effective NHS (Department of Health 1998). The National Institute for Health and Clinical Excellence (NICE) and the National Service Frameworks (NSFs) are two successful initiatives that have emerged from the NHS's national quality agenda. Launched in 1999 NICE uses evidence-based clinical guidelines and associated clinical audit methods to provide authoritative appraisal and national guidance on new and existing healthcare in the areas of public health, health technologies and clinical practice. In prioritizing treatments and innovations as well as in developing and disseminating guidelines, NICE considers clinical evidence, cost-effectiveness and NHS priorities (see https://www.nice.org.uk/). Starting in 1998 a rolling program of NSFs began, focusing on priority conditions including cancer, CHD, diabetes, mental health and services for older people. NSFs provide evidence-based service models and standards that outline what care patients can expect to receive from the NHS for high-priority conditions. NSF models and standards also offer implementation strategies and support and performance measures to assess progress (Department of Health nd e). NICE and the NSFs are considered critical foundations for quality improvement and remain highly regarded by clinicians and leaders across the NHS and around the world. In large part their success is attributed to the transparency of and strong clinical and expert (including patient) engagement in their development. NHS organizations (except for foundation trusts) have regional accountability to SHAs, which play a liaison role between the organizations and the Department of Health. In 2006 the government announced a new architecture for the SHAs, reducing their number from 28 to 10. This restructuring was aimed at streamlining management and administration, redirecting resources to patient care, cutting out unnecessary bureaucracy and giving SHAs a more strategic role. SHAs have traditionally played a central role in performance management, monitoring how well PCTs and other trusts perform and taking action to improve failing services. Given the enhanced role of the Healthcare Commission in performance management, the SHAs' role is shifting to strategic planning and support in the development of local service delivery plans and improvement. The extent to which this shift is actually occurring is unclear. Observers have reported that some SHAs are playing a critical role in ensuring the strategic integration of national and local priorities in local planning and that they have used resources to develop infrastructure to support quality improvement initiatives such as "improvement academies." Such changes, however, are occurring in only a few SHAs. An effort to modernize information technology (IT) in the NHS is being led by one of the world's largest IT programs. NHS Connecting for Health is the single national IT provider for the NHS, delivering an ambitious national program to create an integrated information system to connect and facilitate secure communication among providers and to provide timely decision support. The program has several components, including infrastructure to connect GPs to hospitals, universal access to information-rich resources, electronic patient records with detailed summaries of episodes of care and a lifelong summary of important information. Additional enhancements include electronic booking and prescribing services and a HealthSpace for patients (NHS Connecting for Health nd). Connecting for Health is positioned as a critical lever for improving quality in the NHS. Some sceptics are concerned about the ambitious scope of the project and the need to ensure ongoing clinical involvement in its development (Humber 2004). The Modernisation Agency was established in April 2001 in order to support the NHS reforms. The agency's origins date back to 1999, when four initiatives that were struck to improve quality and efficiency in areas of national strategic priority came together: the National Patient Access Team, the National Primary Care Development Team, Action On and the Clinical Governance Support Team. The Modernisation Agency's goals were to help enhance patient experiences and outcomes, improve access, increase local support, raise standards of care and capture and share knowledge expansively. Some of the agency's most widely recognized work is its leadership and coordination of large, multi-organization collaboratives (especially in the areas of access and wait times, and the development of some of its products, including the Leadership Guides and the 10 High-Impact Changes document). Over a period of four years the agency grew rapidly in size, budget and scope, including over 700 improvement staff, a budget of £200 million and an aim to support a large number of NHS priorities and standards. Despite its successes and the critical role it played to support quality improvement and provide training to enhance capacity and capability across the NHS, the Modernisation Agency came under heavy criticism. Critics pointed to its excessive bureaucracy and size. They also lamented the lack of clinical engagement or relevance in some of its activities and products, which were seen as largely management oriented, and the lack of real integration and implementation of its activities and programs into service delivery planning at the local level. As part of a review of arm's length bodies, the Modernisation Agency was abolished in 2005 (Department of Health nd f). The Clinical Governance Support Team (CGST) was formed in 1999 by the chief medical officer in the Department of Health following the introduction of clinical governance in the Department of Health's consultation document A First Class Service. As of 2001 the CGST was enveloped under the Modernisation Agency. It remained in existence as its own entity following the agency's abolition in 2005. Clinical governance is defined as a "framework through which NHS organizations are accountable for continuously improving the quality of their healthcare services and safeguarding high standards of care by creating an environment in which excellence in care can flourish" (Department of Health 1998). In an October 2006 presentation, the NHS clinical governance support team observed that, backed by a new statutory duty for quality for trusts, the clinical governance framework emphasized the need to instill quality at a local level and includes several components: patient, public and carer involvement; strategic capacity and capability; risk management; staff management and performance; education, training and continuous professional development; clinical effectiveness; information management; communication; leadership; and team and partnership working. Over time the function of the CGST evolved, from one of supporting the development of clinical governance across the NHS through board and clinician training and other programs, to one of providing remedial support to low-performing trusts. Some observers remark that this shift in focus was underpinned by the lack of a clear mission, purpose and strategy for the CGST, especially in the context of other support resources and ongoing reforms in the NHS. Although there are several reports of the successful implementation of aspects of clinical governance throughout the NHS, the extent to which clinical governance is still a dominant framework for improving quality across the system remains unclear. In 2006, the CGST underwent a review by the Office for Strategic Health Authorities. The CGST's future remains uncertain. Following the Modernisation Agency's abolition in 2005, the Department of Health developed the Institute for Innovation and Improvement. Based at the University of Warwick, the Institute was created as a special health authority (at arm's length from government) to support the spread and uptake of new ways of working, new technology and world-class leadership in the NHS. Learning from the experience of the Modernisation Agency, the Institute operates as a compact, lean organization with 50 staff members and a budget of £80 million. It attempts to leverage the broader healthcare environment and focuses on improving outcomes on a few key national priorities that are agreed upon with the Department of Health: no delays (18-week wait), healthcare-associated infections, primary care/long-term conditions, and delivering quality and value (NHS Institute for Innovation and Improvement 2006a, 2006b). The Institute is underpinned by specialist competencies in leadership, learning, service transformation, and technology and product innovation. Its primary work centres on identifying innovations and improvements from a number of sources and then co-designing and disseminating high-impact products to support implementation in the field. The Institute has developed a hypothesis-driven problem-solving process for all of its work in creating high-impact, innovative solutions. 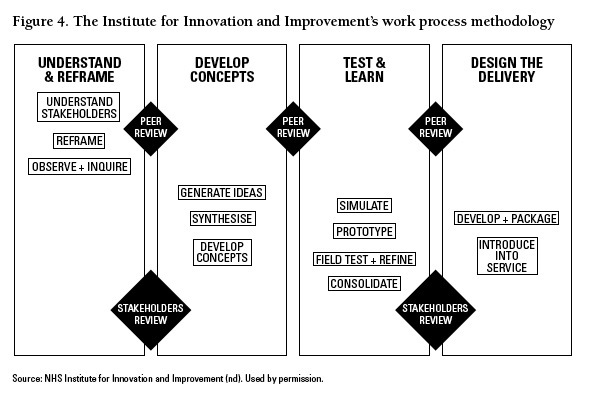 Figure 4 shows the four distinct phases in the Institute's work process. This design-focused role represents a shift in focus from the roles of the Modernisation Agency and the CGST by coordinating large collaborative initiatives and providing more direct support and capability for improvement. One of the initial reasons for this shift was the belief that there may now be adequate capability to facilitate uptake of such tools in the field as a result of the redistribution of former Modernisation Agency staff and funding across trusts and SHAs. Some observers, however, remain sceptical about the actual extent of improvement capability across the NHS. Recognizing this, the Institute has begun to test strategies to better leverage and work with leaders and improvement staff across the NHS to support implementation. For example, the Institute recently engaged a former SHA CEO as a "field force" relationship manager to act as a bridge between the Institute and the field. 1989 Working for Patients The Conservative government's white paper that outlines a plan to create an internal market and competition in the system through a split between purchasers and care providers and the introduction of fundholding for GPs to allow them to purchase care for their patients (NHS nd b). 1997 The New NHS - Modern, Dependable (Department of Health 1997) A white paper by the new Labour government that sets out a plan to modernize the NHS. The new approach is "based on partnership and driven by performance." It preserves the principle of a primary care-led NHS but moves away from the internal market and outright competition. The paper outlines six principles underpinning this new approach, including taking quality as a driving force for decision-making at every level. 1998 A First Class Service - Quality in the New NHS (Department of Health 1998) A consultation document that outlines new initiatives and tools for setting, delivering and monitoring standards for a high-quality, cost-effective NHS. These include NICE, an independent body responsible for providing authoritative appraisal and national guidance; NSFs, evidence-based service models and standards; clinical governance, a new framework backed by trusts' statutory duty for quality and through which organizations are accountable for continuously improving the quality of their healthcare services and safeguarding high standards of care; and the Commission for Healthcare Improvement (CHI), a statutory body established to provide independent scrutiny of local efforts to improve quality and report publicly on the performance of local organizations. 2000 The NHS Plan - A Plan for Investment, A Plan for Reform (Department of Health 2000) Delivering the NHS Plan - Next Steps on Investment, Next Steps on Reform (Department of Health 2002) This ten-year plan, and its follow-up progress report, helped to bring into focus the government's strategies to modernize the NHS. The plan outlines substantial growth in the NHS budget (i.e., by one half in cash terms) and investments in capacity (e.g., facilities, staff, medical school places); an increase in the number of physicians entitled to discretionary payments in the private sector; and reforms aimed at devolving power from government to the local health service in a system of "earned autonomy." These reforms include PCTs holding the majority of the NHS budget and having the freedom to purchase care from most appropriate provider (public, private, voluntary); national targets, public performance ratings (especially for wait times) and incentives for high-performing local organizations, including administrative autonomy through designation as a foundation trust and consequences for poor-performing organizations, such as executive replacement; quality-based contracts for GPs and cash incentives to physicians for high-quality care; changes in job design, such as extended scopes of practice for nurses and therapists; a Modernisation Agency to provide technical support to spread best practices; a new hospital payment system called payment by results that uses a regional tariff or case-mix system; an integrated and modernized electronic health information system; and better integration between health and social care. 2004 The NHS Improvement Plan: Putting People at the Heart of Public Services (Department of Health 2004) Building on progress to date to continue the push to meet national targets to reduce wait times, this paper outlines shifts in priorities (to 2008) toward prevention and management of chronic conditions and local target-setting and performance management, especially for high-performing trusts. In addition, this plan outlines additional priorities such as greater personal choice for non-emergency care, an electronic booking system and the right to choose from at least four or five different healthcare providers; an Expert Patients' Programme designed to help empower patients to manage their own conditions; innovations such as NHS Direct (nursing-led telephone advice); and additional IT enhancements, including electronic booking and prescribing services and a HealthSpace for patients. 2006 Our Health, Our Care, Our Say: A New Direction for Community Services (Department of Health 2006a) This white paper focuses on advancing a vision for better health and social care that "puts people more in control, makes services more responsive, focuses on those with complex needs and shifts care closer to home, while achieving better value for money." Specific actions for change outlined in the paper include: PBC, which gives GPs more responsibility for local health budgets, in conjunction with individual budget pilots to test how users can take control of social care and changes to payment-by-results tariffs to support these changes; a guarantee of registration with a GP practice list and incentives for GP practices to offer convenient opening times and appointments; more care in more local and convenient settings, including the home, by working with royal colleges to define clinically safe pathways within primary care; better infrastructure to support the integrated commissioning of health and social care between PCTs and local authorities; and an increase in the quantity and quality of primary care in under-served and deprived areas, including through the removal of barriers to entry for the "third sector" as primary care providers. Appleby, J. and J. Dixon 2004. "Patient Choice in the NHS (Editorial)." British Medical Journal 329: 61-62. Beedon, J. and S. Christie. 2006. "Bringing Multiple Competing National Health Service Organisations Together." Paper provided by authors based on chapter for B.B. Bunker and B. T. Alban, eds. 2006. The Handbook of Large Group Methods: Creating System Change in Organizations and Communities. San Francisco: Jossey Bass. Birmingham East and North Primary Care Trust. 2006. Annual Public Health Report. Birmingham: Author. Birmingham East and North Primary Care Trust. 2006b. "Unusual Trophy Awarded for Antibiotic Prescribing Success." Cascade (1): 16. Birmingham East and North Primary Care Trust and Heart of England Foundation Trust. 2006. Accelerating the Pace of Change: Programme Progress Report. Birmingham: Authors. Birmingham OwnHealth. 2006. Outcomes Report for Birmingham OwnHealth for Presentation to Birmingham East and North (BEN) PCT Professional Executive Committee. Birmingham: Author. Collins, J.C. and J.I. Poras. 1994. Built to Last: Successful Habits of Visionary Companies. New York: Harper Collins. Dixon, J. 2004. "Payment by Results: New Financial Flows in the NHS (Editorial)." British Medical Journal 328: 969-970. Enthoven, A. 2000. "In Pursuit of an Improving NHS." Health Affairs 19(3): 102. Greener, I. and R. Mannion. 2006. "Does Practice-Based Commissioning Avoid the Problems of Underfunding?" British Medical Journal 333: 1168-1170. Heart of England Foundation Trust. 2006a. Annual Performance Report, 2005-2006. Birmingham: Author. Heart of England Foundation Trust. 2006b. Briefing Document Prepared for Quality by Design Project Team. Birmingham: Author. Higgins, J. 2007. "Health Policy: A New Look at NHS Commissioning." British Medical Journal 334: 22-24. Humber, M. 2004. "National Programme for Information Technology." British Medical Journal 328: 1145. McGauran, A. 2004. "Moving 15% of Procedures to Private Sector Will Wreck NHS." British Medical Journal 329: 1257. NHS Institute for Innovation and Improvement. 2006a. 2006/2007 Plans (2006/07 to 2008/09 Strategic Plan). London: Author. NHS Institute for Innovation and Improvement. 2006b. 2006/07 Business Plan. London: Author. SteelFisher, G. 2005. International Innovations in Health Care: Quality Improvements in the United Kingdom. London: Commonwealth Fund.